The Resistance! 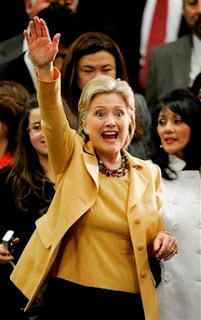 : NAACP says Heil Hilary! February 19, 2008 -- Mayor Bloomberg charged yesterday that "fraud" was behind the unofficial results in the New York Democratic presidential primary that produced zero votes for Barack Obama in some districts. "If you want to call it significant undercounting, I guess that's a euphemism for fraud," said the mayor. Unofficial tallies on election night gave Obama no votes in 78 election districts where in reality he had hundreds in each. Hilary you got some splanin' to do! Where is the outrage at Hilary's racist election fraud? Hello? NAACP where are you when you are really needed? Oh that is right, your leaders enslaved on the democrat's wellfare plantation long ago. Where are the rhyming' reverends? Where are the civil rights leaders? Where is Al Sharpton? Why isn't Jessie Jackson flying in to NY to protest and shouting “disenfranchisement?” A black man running for president was cheated by the political machine of a white person. Why isn’t this front page news? Where is the march on Hilary Clinton’s headquarters? Where are the criminal and congressional investigations? Where are all the bleeding heart liberal news media types with inflammatory hit jobs on the white candidate? Its funny how a white liberal can totally give a black liberal the shaft and no one bats an eye. When will all Americans both black and white realize that republicans and democrats are both stealing elections and stealing our freedoms. When will we wake up and realize Ron Paul is the only real freedom loving, small government, pro-capitalist, equal protection under the law, pro-privacy, anti-war candidate? VOTE RON PAUL!